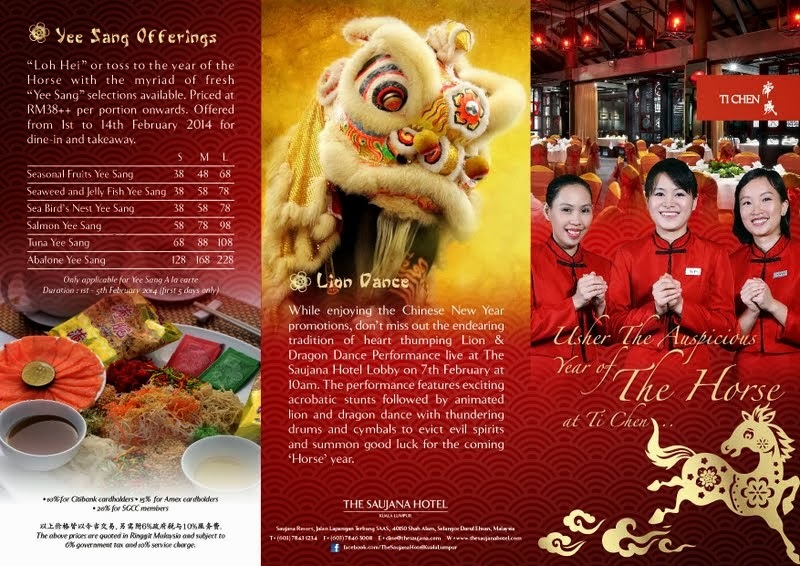 Link, Pullman Kuala Lumpur Bangsar: Welcomes the Year of The Horse with Properity Chinese New Year Buffet! It’s a Big Bang of Flavors at Link’s CNY Festive Buffets! This festive provides an excuse to indulge! And what better way to do so than to succumb to a kaleidoscope of festive favorites with family and friends on this auspicious Chinese New Year of the Horse at Link, an all-day dining restaurant at Pullman Kuala Lumpur Bangsar. The Chinese believes that the New Year revolves around 5 blessings of longevity, riches, peace, wisdom and virtue. With the belief in mind, Link’s Chef Lee Yew Ken and the kitchen team has whip up a luscious spread of Chinese festive dishes symbolized with the 5 blessings. Link is wide and spacious, elegantly designed with bold contrasting colors of red, white and black. It can accommodate large parties and even has its own private dining room. 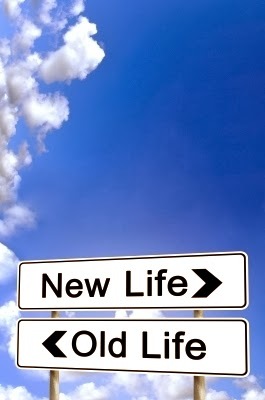 Its all about choices at Link. Their buffet spread is large in every section. There are also live stations preparing fresh food upon order. This New Year, Link is offering many classic favorite Chinese dishes and we got a sneak peak at its menu. We were entertained by traditional Chinese music featuring a couple playing the Gu Zhen and Er Hu that evening which was really beautiful and mesmerizing. Throughout the festive month, guests are treated to a series of festive performances to complement the festive buffets. There will be Caligraphy Art and Traditional Chinese Music Band during dinner time on 21st, 24th, 26th, 27th, 28th, 30th January and 7th to 8th February 2014. Southern Shaolin Kung Fu performs on 7th to 8th February 2014 while Acrobatic Lion Dance with firecrackers lighting ceremony that takes center stage on the auspicious date of 4th February 2014 at 11.00am. Make sure to catch these performances! 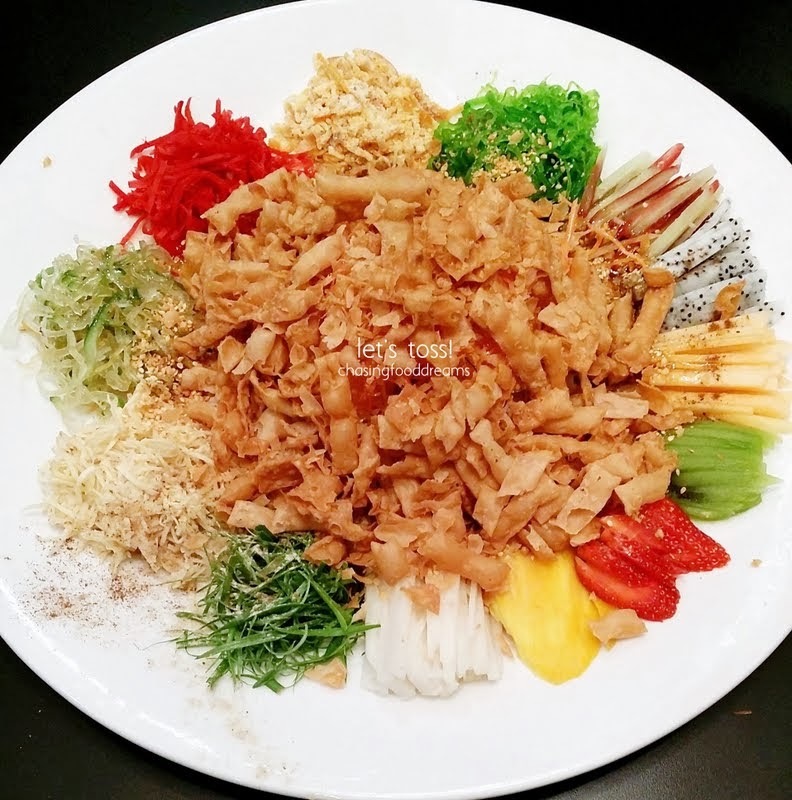 Making its usual mark for the festive season is Yee Sang. 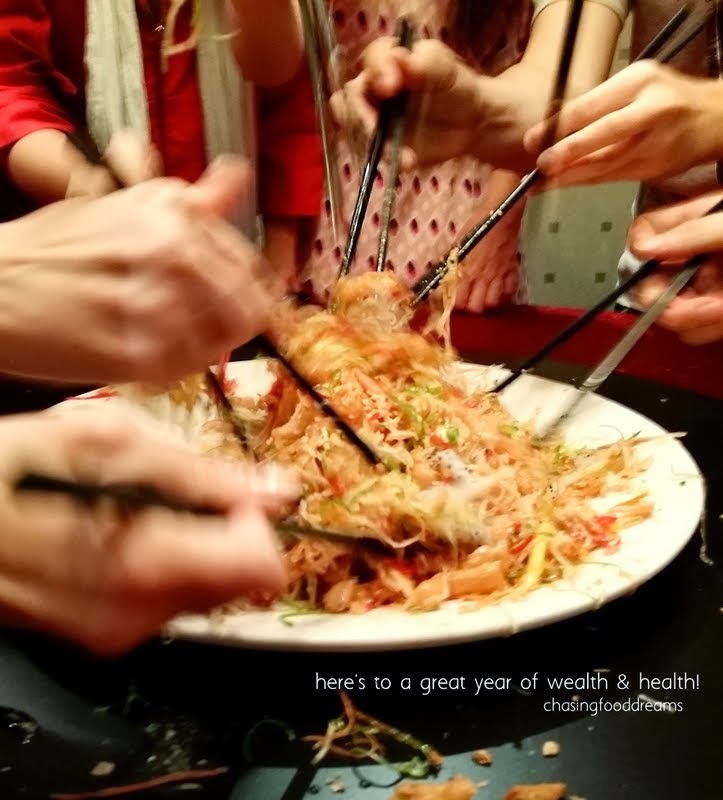 It would hardly be a complete celebration without the tossing of the auspicious Yee Sang. At Link’s festive buffets, guests can creatively concoct their own unique Yee Sang with a wide selection of ingredients that features lots of fresh and pickled julienned vegetables and fruits, crispy crackers and the assorted array of butterfish, tuna and salmon. If you can’t decide, have all three fishes to your hearts’ content. Toss the Prosperity Yee Sang with their chef’s special wasabi plum sauce! Traditional dishes with auspicious significance of the 5 blessings are served and these include Double Boiled Cordyceps Flower Broth with Chicken, Braised Sea Treasure with Fried Garlic, Steamed Snapper Fish with Fried Ginger and Soya Sauce, Wok Fried Prawns with Curry Leaf & Butter, Braised Dried Oyster with Fatt Choi and Deep Fried Paper Wrapped Chicken. I personally love the Double Boiled Cordyceps Flower Broth with Chicken for its earthy warm notes while the Braised Sea Treasure with Fried Garlic features an abundance of seafood like Sea Asparagus, Clams, Dried Scallop and more all beautifully braised in a rich brown sauce. The Wok Fried Prawns were succulent and creamy and another favorite of mine has to be the Braised Dried Oysters with Fatt Choi where cabbage rolls filled with dried oysters and fish paste are deliciously soft and tasty. There are also other signatures like Marinated Crystal Rolls with Jellyfish, Shanghai Cold Chicken with Peanut Sauce, Aromatic Steamed Snapper with Teow Chew Sauce, Oven Roasted Five Spice Duck and many more! Did I mention that the dessert section at Link is vast and lots of festive sweet goodies will be tempting your taste bud this festive season? From Pineapple Tarts to Ping Pei Red Bean Roll, Plum Dumpling, Sweet Lotus Soup, and Chinese Baked Egg Tarts to the icy treat of sumptuous Ice Creams, choosing a few would be a hard decision. I highly recommend the Ice Cream bar which features a luscious Strawberry and Cheesecake ice cream that was so good, I had two scoops of it! 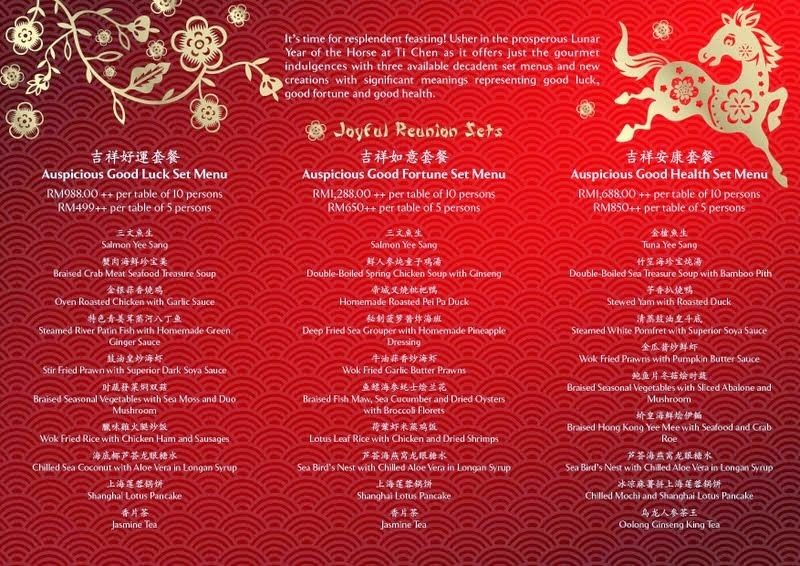 The Prosperity Chinese New Year Buffet is priced at RM90nett per person for lunch and RM106nett per person for dinner. 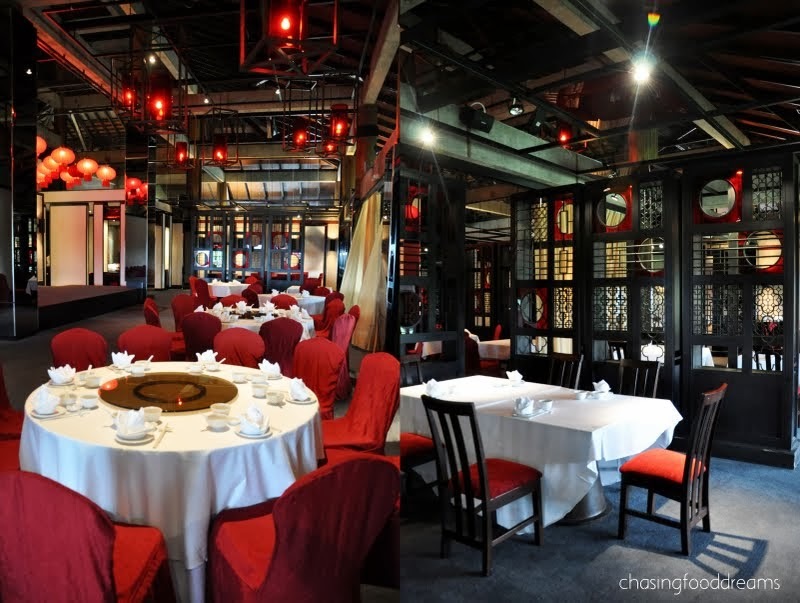 While with the upgraded dinner menu for Chinese New Year’s Eve on the 30th January 2014, the Reunion Dinner Buffet is priced at RM108nett per person and RM138nett per person with house pouring beverage. For reservation, please call 603 2298 1855. 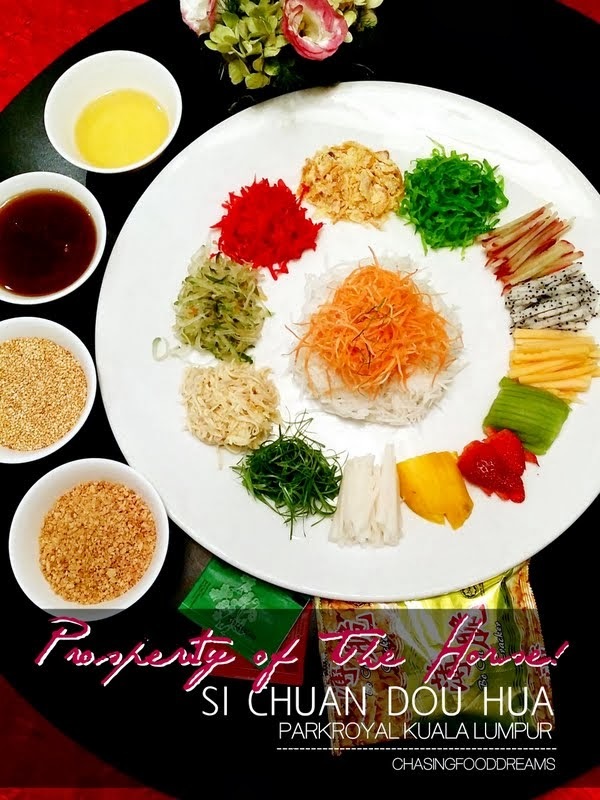 Ti Chen, The Saujana Hotel Kuala Lumpur: An ‘Horsepicious’ New Year! Celebrating The Year of The Horse with Sumptuousness! Usher in the prosperous Lunar Year of the Horse at Ti Chen, better known as the “Emperor’s Palace”, as it offers gourmet indulgence with three available decadent set menus and new creations with significant meanings representing good luck, good fortune and good health! Located at The Saujana Hotel Kuala Lumpur, Master Chef Lai Chong Seng has whipped up a menu of his signatures filled with festive dishes to please. 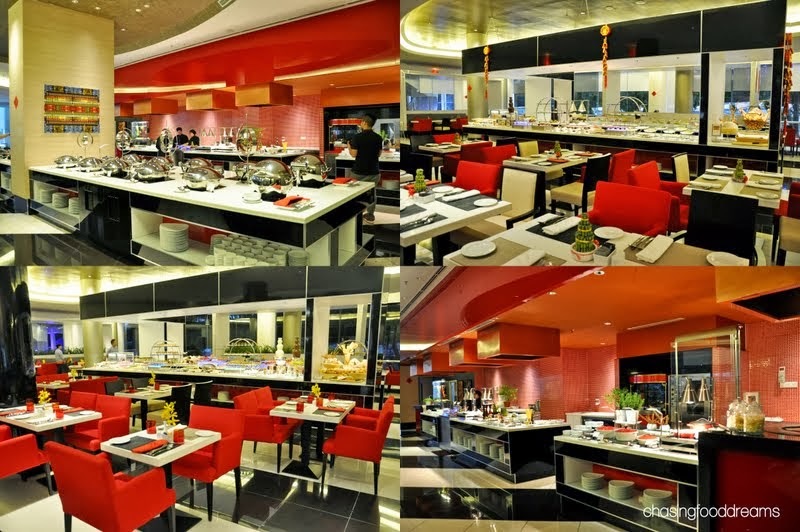 Ti Chen is simply made for fine dining in a rich oriental themed ambience. The restaurant is sectioned with dark wood panels for lots of privacy while the restaurant offers a lovely view of the green golf course or night city lights. We were back at the restaurant recently for a preview of some of the festive dishes. Besides Chinese main dishes, Ti Chen is also synonymous for serving luscious Dim Sums that is injected with lots of modern touches. Gather your loved ones at the elegant Ti Chen this festive season for lots of scrumptious choices of Yee Sang from the classic Salmon Yee Sang to the modern Seasonal Fruits Yee Sang and Seaweed and Jelly Fish Yee Sang to the lavish Sea Bird’s Nest Yee Sang, Tuna Yee Sang and Abalone Yee Sang. We savored the Salmon Yee Sang and were pleased at its flavors. It’s executed with the must-have textures and well balanced flavors of sweet and sour. The Homemade Roasted Pei Pa Duck was the crowning glory as the duck was so succulent with super crispy skin. It was not fatty at all and the flavors have a robust meaty note. Great tender meat coupled with the rich sweet hoi sin sauce which boosts up more flavor notes. I lost count of how many pieces I ate because it was that good! Despite the boldness of the appearance, Steamed River Patin with Green Ginger Sauce is beautifully balanced in flavors. Chef Lai has concocted his signature green ginger sauce that pairs so well with the river fish, gently enhancing the stronger flavors of the fish. The sauce is not overpowering at all despite the amount. A light superior soy sauce added more depth to the fish. I had another version with cod and it works just as well last year. I was expecting the Wok Fried Prawns with Pumpkin Butter Sauce to be sweet but it was just right. Very subtle sweetness of the creamy buttery pumpkin was cleverly spiced up with heat of chili and lots of curry leaves for aroma. The crustaceans are juicy and finger-licking good. I like how the light spiciness really brings out the savory flavors of the pumpkin sauce. Dessert is perfect to usher in the New Year with much sweetness in Sea Bird’s Nest with Chilled Aloe Vera in Longan Syrup. Sea Bird’s Nest is actually a type of seaweed or coral grass from the sea. It is rich in enzyme nutrients, minerals, calcium, iron and jelly from protein. Here it makes a nice textural component in the aromatic longan boiled syrup with bits of aloe vera and red dates. The three decadent set menus are the Auspicious Good Luck Set Menu which is worth RM988++ per table of 10 persons, the Auspicious Good Fortune Set Menu which is worth RM1,288++ per table of 10 persons and lastly, the Auspicious Good Health Set Menu worth RM1,688++ per table of 10 persons. Our Today Moments with Friso, Growing Up Together! Time is Precious, So Use It Wisely! In my life, I do admit to being blessed in many ways. Of course my biggest miracle would have to be my little boy. Truth be told, I really never thought I would have a child let alone be a mother to the little one. Growing up in a big family, I had lots of chances with all my nieces and nephews and I know that it takes a lot to nurture them and be a responsible parent. And so I was intimidated at the thoughts of having one. I had my little one fairly late in my 30s and of course, I wasn’t prepared for this. In fact, I was really afraid as I wasn’t sure on how to be a mother. My parents were really strict with me while growing up. Don’t get me wrong, my parents are really great to me and of course I did rebel a few times in my teens but I realized it later how they were only trying to protect me and teaching me the rights and wrongs in life. Strangely also, I never thought much on what it takes to be a mother till I became one. Of course my mom, I love her so much, is the greatest mom I am blessed with. She never complains and always just tries her best to take care of the family with all the household chores and meals. She had never had much education while growing up since she had to take care of her brothers and sisters and so she also never had to work since all her life was to take care of everyone else. She married young to my dad and continue what she does best, caring and nurturing all of us. All these lead me to always never really realizing how much she sacrifices for all of us until I left home. When Dad passed away 21 years ago, she stood strong in front of us, never really showed us how much it devastated her. She became a tower of strength, bring up all six of us alone. Fast forwarding to five years ago, I became pregnant and my little one is almost five years old now. Thinking back then, I was afraid… afraid on how to be a good mother. There are lots of parenting books but truthfully, none really prepares you to be a mother. When D (my little one) was born, things changed. In fact, my world changed completely. I was working in an environment that took up most of my time each day. I decided that my work condition have to change. I took on another role to be able to work on a more normal hour job scope but that still means a nine-to-five kind of job. D was placed with a nanny during the day and I would rush to pick him up after seven thirty each evening. By the time I reach home, I was tired. I would play with him for about two hours before D would snooze off for the day. Of course with D, both my hubby and I have less time for ourselves as there are still household chores and work to be done before we go to bed. I find time suddenly vanishing each day and I honestly yearn for more time on some days. I was lucky in some ways as D was a really good child. As long as he is well fed and he is comfortable, he would snooze off at any chance he could get. Looking back, I also realize D spent more time with his nanny than me when growing up since she had him more hours than I had with D each day. But I wasn’t able to watch him grow up as much as I wanted. To be honest, if I have a choice, I would have loved to be a full time mother for D but financial matters didn’t allow this. Recently, I was engaged in Friso’s ‘Our Today Moments’ campaign. The campaign is to create awareness to the public on how to get the most out of our time with our precious little ones. When I was filling out a survey for Friso Gold, I realize that that somewhere along the way of being a mother, I have actually lost track of my initial goal in life when I became a mother. In addition to work, and blogging, I have also spent less time with D over the last year. It was always a mad rush each day and after work, I would reach home late around 8-9pm each day. Meaning after dinner and shower, it was really little time spent with D each night. I am also missing out all his growing moments more and more lately. In fact, sometimes it got to the point that I plan my day based on my activities rather than what he wants to do. The survey also reported that a typical Malaysian fulltime mother spends an average of 6 hours and 45 minutes with her kids in a day but a working mother spends about 4 hours only. While the fulltime mother or housewife reported a 60% quality time out of the average time she has with her kids, working mothers reported only 30% quality time from the 4 hours. It’s really hard for me too from a working mother’s standpoint as I can relate to the above said. It’s not because I don’t want to but I admit to getting distracted and sidetracked all the time with everything that is going around. 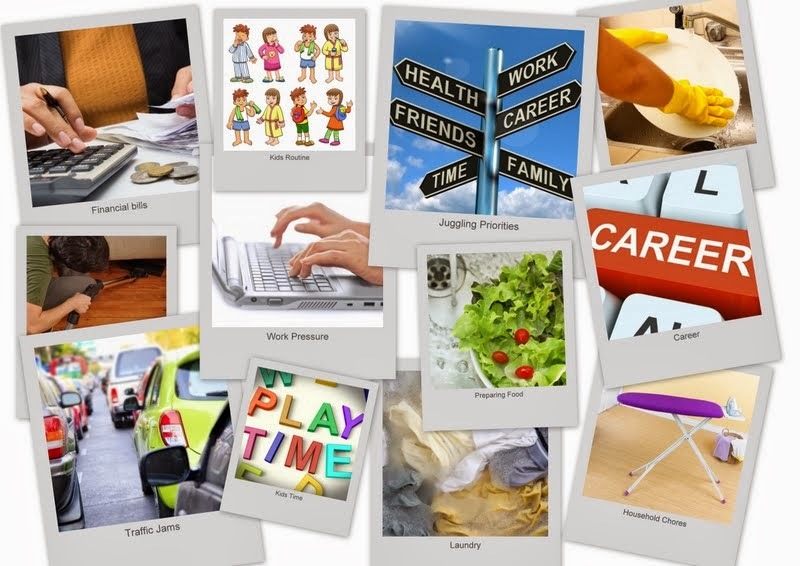 It is also quite stressful to juggle everything together from family to work and blogging as well sometimes and manage them all well. It really takes a lot to be a mother and I realize it once I became one myself. I admit to being guilty at times but I also want to ensure that I can work hard enough to provide a better life for D. Sometimes I also want to have some fun with D but I can be at lost for ideas. But the most important thing to me of all, is that I wish to be D’s mother and friend at the same time and bringing him up to the very best I can. What about you? Do you face the same issues like me? Thanks to Friso Gold, I am reminded again of my priorities in life with my family, especially D. It is really important to spend time, and not just time but quality time, with your children. 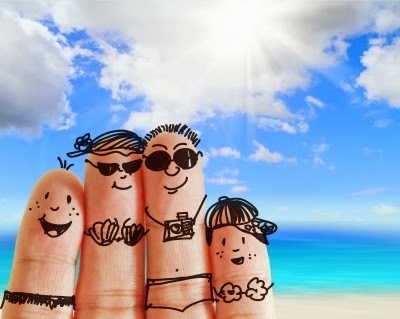 Time is so precious so make sure we all use it wisely, especially with our loved ones. It’s really not as difficult as we think, we just need to know how to plan, prioritize and make the effort for our precious little ones. Time waits for no one so let’s all create Our Today Moments!